Wilderness dish towels in neutrals and browns. 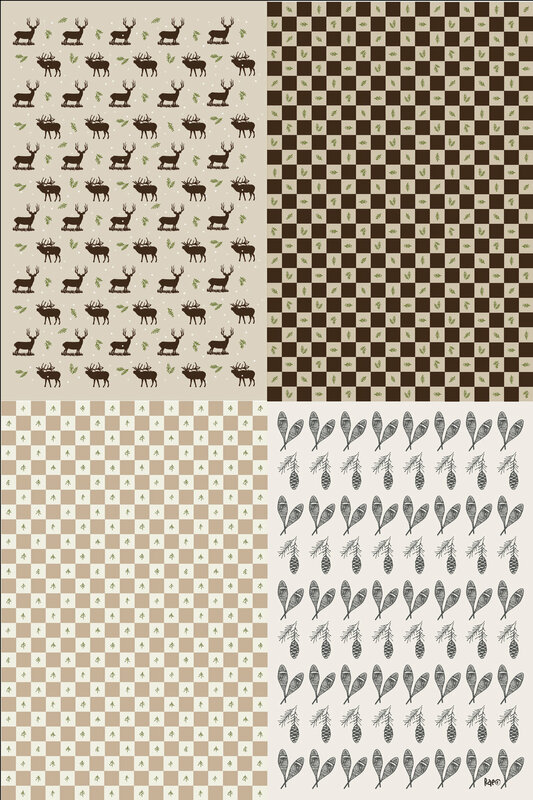 These are fabrics from the now completed Wilderness Collection. These were a birthday present for a girlfriend who vacationed in Alaska last Summer. They were a hit. These dishtowels are available on Spoonflower in my shop. You can also buy additional yardage for napkins too. If you are buying the dishtowels you get all 4 towels on one yard of 54" x 36" cotton, linen, canvas fabric. You just cut them apart and hem the edges. My friend, the talented Jessica, of Jack + Ella Paper has a newly designed website and a wholesale catalog. Check her out here. Not that I am bragging or anything but I lettered her new logo and lots of my doodle illustrations show up on her cards. You can stock up here. I am my mother's daughter. Betty sent a lot of cards. She always had a box or two of all occasion cards to send on a moments notice. I sent 2 birthday cards this morning and have a get well card that needs to go out this week too. So much easier when you already have cards on hand. I am going to send more newsletters. If you would like to receive one sign up on the right. (You can only do this on the computer, sorry.) If you are new to the list and would like a free font go to the fonts page and pick one out. Email that to me using the ASK RAE link at the top. Have a great week everyone!